Application: Slotted screws and actuating tool for spring terminals. Blade: Reduced blade diameter with integrated protective insulation, allows sunken screws and spring elements to be accessed and actuated. Wera VDE tools provide more safety than required by current regulation. Tested individually for dielectric strength under a load of 10,000 volts, ensuring safe working with loads up to 1,000 volts. Impact strength tested at - 40°C, guaranteeing safety even under extreme conditions. The 05006441001 Wera Kraftform Plus 160 iS VDE Insulated Slotted Screwdriver is one of thousands of quality tooling products available from MRO Tools. Please browse Wera 100 Series Kraftform Plus VDE Slotted Screwdrivers for tools similar to the 05006441001 Wera Kraftform Plus 160 iS VDE Insulated Slotted Screwdriver. 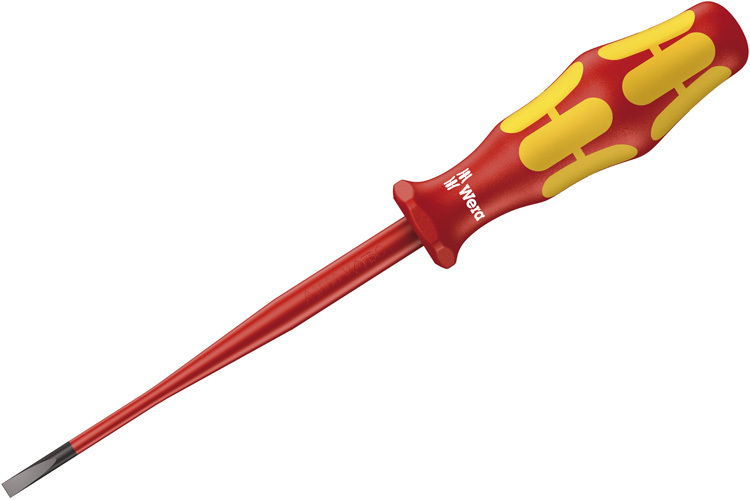 05006441001 Wera Kraftform Plus 160 iS VDE Insulated Slotted Screwdriver description summary: Wera Kraftform Plus 160 iS VDE Insulated Slotted Screwdriver. Blade Thickness: 0.8mm Blade Width: 4.0mm / 5/32'' Shank Overall Length: 100mm / 4'' Handle Overall Length: 98mm Quantity discounts may be available for the 05006441001 Wera Kraftform Plus 160 iS VDE Insulated Slotted Screwdriver. Please contact MRO Tools for details.